Wiley combines subjects from African American street culture with images from the Old Masters of the Renaissance through 19th century. You’ll see skateboard kids, hip hop artists, athletes, guys hanging out on street corners, dressed in their regular clothes, but in traditional poses or on horses, like great centurions, as he “deconstructs” contemporary images. But his subject matter is essentially about race, culture, history and the Black experience, not just in America but in Africa and South America. 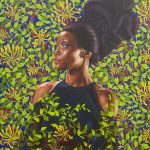 “By replacing the European aristocrats depicted in these paintings with contemporary black subjects, Wiley draws attention to the absence of African Americans from historical and cultural narratives,” the museum says in its introduction to the exhibit. Wiley spoke to a few hundred-people last month in Toledo. He told the audience that museums through the generations have shown works depicting people in powerful positions. His art turns that “narrative” on its head. “My work has always been about the self-embrace of the people around you,” he said. Wiley is also extremely interested in the human form, and the portraits have a technical exactness. The painting backgrounds, too, are exotic – highly filigreed, flowered or elaborate rococo images that could be tapestries themselves. Many of Wiley’s portraits are also huge or life size, demonstrating the power behind the people he paints. His own racial stereotypes aside, he needn’t have worried. Maybe he should deconstruct the varied people of Toledo.